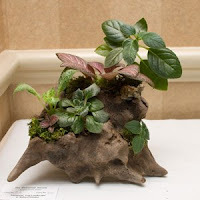 The National Capital Area Chapter of The Gesneriad Society: Class 67 - natural garden over 12"
Class 67 Natural Garden (planted on rock or wood) - exceeds 12" in at least one dimension and not to exceed 24 inches in any dimension. Entry No. 322, Natural Garden, over 12 inches, exhibited by Jill Fischer. Score: 91. First Place. Entry No. 503, Natural Garden, over 12 inches, exhibited by Paul Kroll. Score: 87. Second Place. Entry No. 210, Natural Garden over 12 inches, exhibited by Barbara Stewart. Score: 86. Third Place. Entry No. 458, Natural Garden, over 12 inches, exhibited by Mel Grice. Score: 80. Entry No. 463, Natural Garden, over 12 inches, exhibited by Lee Linett. Score: 76.